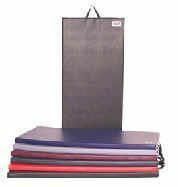 The EZ Roll sport mats for MMA, wrestling, taekwondo, judo, gymnastic, wall padding etc... Great for home & school environments. Manufactured with closed-cell, cross-linked polyethylene foam, renowned for its shock absorption and resiliency. RUBAGYM mats are lightweight, easy to transport, and easy to roll into position. Individual rolls may be easily and safely carried by just two people, and a full floor can be moved and set up in a matter of minutes. 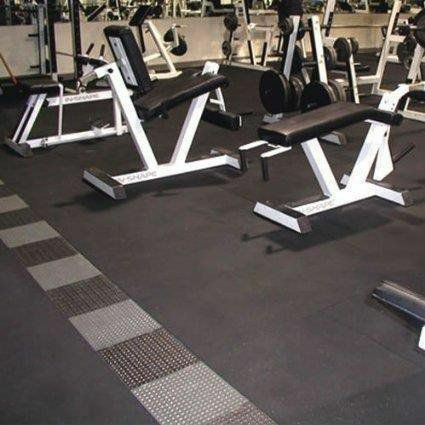 Durable Rubber Mats excellent for use in home or commercial gyms. 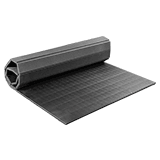 Velcro Crash Mat, Black Vinyl - 47.5" x 118" x 2"
Nothing hurts more than working out on a hard surface. 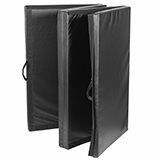 The 29.5" (75cm) x 47.5" (120.5cm) x 2" Vinyl Crash Mats are ideal for gymnastics, indoor rock climbing, high jump, cheerleading and other training programs. They are designed to help pad the floor and help absorb impacts. 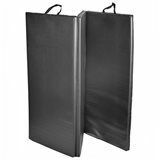 The Vinyl Crash Mat's are also designed to not restrict your movements, yet still provide you safety while exercising. The surface is a vinyl wrap and is easy to clean. The mats have velcro attached to connect multiple mats together to create larger surfaces perfect for exercises that require a large amount of space or group exercises. The mat also folds away for easy storage and transportation. If you're searching for or find yourself wanting extra padding on your workout surface, then you know the importance of having high-quality mats in the areas you practice in most. Each panel measures 29.5" (75cm) x 47.5" (120.5cm) x 2" and folds up to 29.5" x 47.5" x 8"